Hubble Space Telescope image of the Carina stellar nursery. 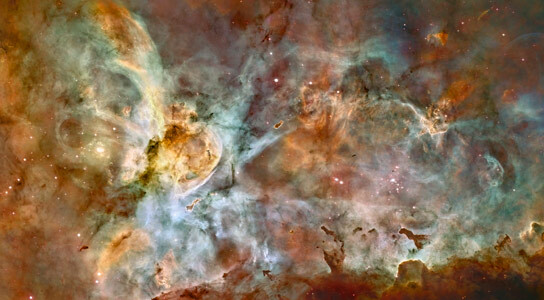 A newly published study about the Carina Nebula is helping astronomers better understand the processes that may have contributed to the formation of the sun 4.5 billion years ago. The Carina Nebula survey is published in the Astronomical Journal. The Carina Nebula spans more than 100 light-years and is visible to the naked eye as a bright glowing patch in the Milky Way for observers in the Southern Hemisphere. In addition to thousands of stars similar in mass to the sun, Carina contains more than 70 O-type stars, each with a mass between 15 and 150 times that of the sun. O-stars burn hot and bright and die young, typically within 10 million years. These massive stars play a key role in how less-massive, solar-type stars in the same region evolve because O-stars evaporate and disperse dust and gas that might otherwise collect in a disk to form planets around the low-mass stars. Hartigan said O-stars also have a profound influence on their parent molecular clouds. “Ultraviolet radiation from these hot, massive stars ionizes molecular hydrogen, and as the radiation evaporates the molecular cloud, O-stars carve beautiful pillars and clear the space around smaller stars that exist nearby,” Hartigan said. A famous example of these pillars is found in the Eagle Nebula and was the subject of the “Pillars of Creation,” one of the most-recognized images from the Hubble Space Telescope. Hartigan said the sculpting process that creates such pillars marks one stage of the destruction of a molecular cloud. In the first stage, the outer wall of the cloud appears largely unbroken. Fat pillars form first and are steadily eroded into skinny pillars that eventually become isolated globules that are disconnected from the receding wall. Often, a young star with a disk is present at the apex of a pillar or within a globule. The entire evaporation process takes about a million years, and astronomers believe it is an essential aspect in the creation of solar systems like our own, Hartigan said. The Carina star-formation region is about 7,500 light-years from Earth, about five times farther away than the Orion Nebula, which is visible in the northern hemisphere but is only about one-tenth the size of the Carina Nebula. The new images of Carina show multiple examples of each of the different stages of cloud destruction. In the new survey, Hartigan and colleagues Megan Reiter and Nathan Smith of the University of Arizona and John Bally of the University of Colorado used the National Optical Astronomy Observatory’s Extremely Wide-Field Infrared Imager and its Mosaic camera to photograph the entire Carina region from the four-meter Blanco telescope at Cerro Tololo in northern Chile. Both the optical and near-infrared imagers use large-format detectors to obtain high-resolution shots of wide swaths of the sky. Each of the images isolates a specific wavelength of infrared or optical light. By looking at these wavelengths separately and in composite, Hartigan and colleagues were able to penetrate Carina’s nebular dust and hone in the pillar-carving processes caused by O-type stars. Hartigan said numerical simulations in recent decades have suggested that strong stellar winds from O-stars also induce star formation by compressing material in a molecular cloud to the point where it becomes gravitationally unstable, a process known as triggering. He said the new images reveal important constraints on this process. While many of the pillars, globules and other structures that were detailed in the study were previously known to astronomers, Hartigan said the new images reveal details about the underlying physics of the region. “Our images are sharper and deeper than previous ones, and they provide the best snapshot so far of a massive star-formation region at one point in time,” he said. 1 Comment on "Survey of Carina Nebula Reveals Details of Star Formation"